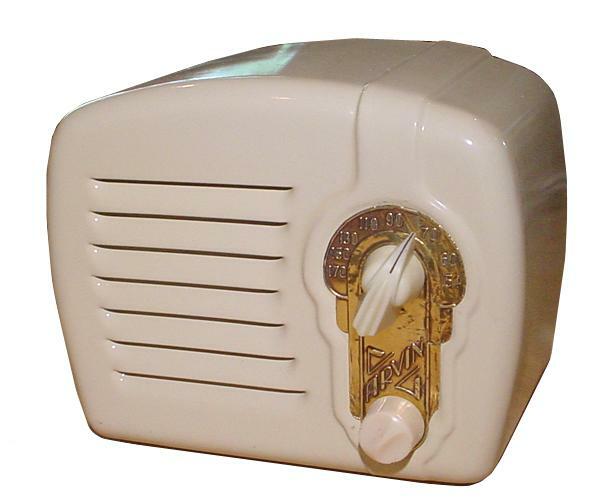 This midget Arvin, a product of Noblitt-Sparks Industries, was one of many inexpensive sets marketed primarly towards children and college students. Undereath the ivory paint is a sturdy metal case that houses a fairly simple 3-tube radio. The model 40 actually only has two tubes: 25B8 and 70L7, so I believe my example has the chassis of a model 402A with the tube lineup listed above. The 402A chassis has the same knob layout but was originally housed in a slightly different cabinet.